Ellerbeck Freedom is out of Ellerbeck Feather and by John Wilf and is fifth generation home-bred. He actually has a medium amount of feather but these past wet months have caused it to be burnt off. He is of course just field filthy here and if i ever get him cleaned up i think he would look gorgeous. For those of you who are more discerning, yes you are right, his off-fore knee looks a bit lumpy, one of his girlfriends had obviously booted him but actually he has very good flat bone and the swelling soon disappeared, stallions have a hard life you know. Here he is pictured the other day aged five years old. 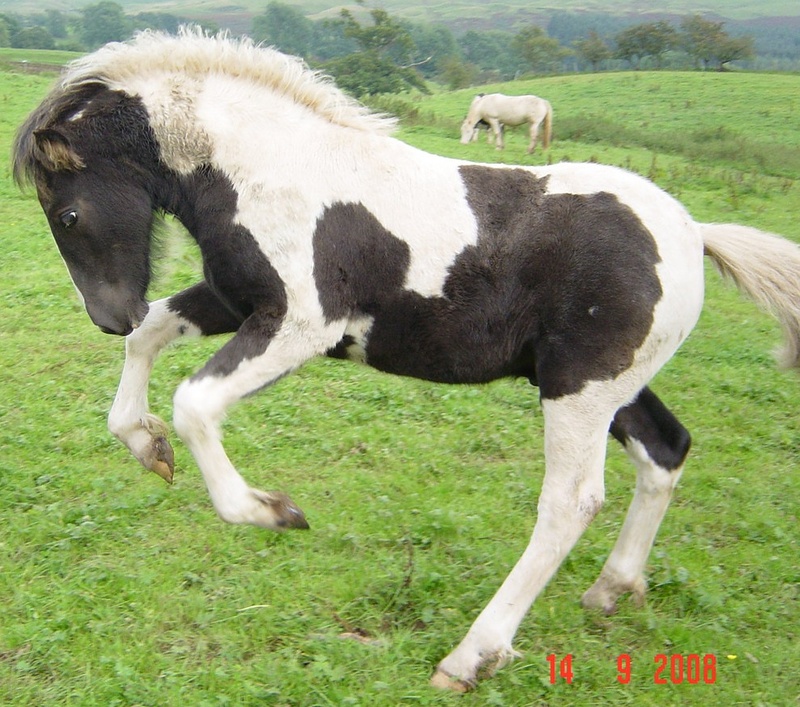 Ellerbeck Windblown is a tough little black and white colt and looks like making about 13.0hh. His mum is Moonstone. He now looks very special and is showing a lot of quality, I bet he will make a smashing show pony and think he will be a good driving pony but equally some child could have a wonderful riding pony. Ellerbeck Montana never even got as far as being advertised, a visitor to the field loved her on sight and so a deal was struck. She is the first foal out of Pride whom i bought in last year and I must say I am very pleased with this filly so have covered Pride again with Freedom though originally had planned to use John Wilf on her. Montana is growing well and has a lovely sensible attitude. 2009 This is a lovely filly from a mare who ran with Freedom last summer and then travelled to her new home down south with Julie. Needless to say, Julie is delighted and plans to keep this one. Would tell you her name but cannot recall it. Freedom can rest easy now, he has thrown lovely foals so can continue in his post.